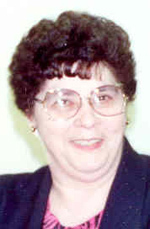 Patricia M. LaCroix, age 72 of Faribault, died Saturday, April 25, 2009 at her home. Mass of Christian Burial will be held on Wednesday, April 29, 2009 at 10:30 a.m. at the Divine Mercy Catholic Church, at Sacred Heart in Faribault. Interment will be held at St. Lawrence Cemetery, Faribault. Visitation will be held at the Parker Kohl Funeral Home in Faribault on Tuesday from 4:00 to 8:00 p.m. and at the church on Wednesday for one hour prior to services. The Faribault Aerie 1460 Fraternal Order of Eagles Auxiliary will conduct a memorial service on Tuesday evening at 6:30 p.m.
Patricia Margaret Zimmerman, the daughter of Wallace and Rachel (Bushey) Zimmerman, was born on March 5, 1937 in Faribault. Pat attended Bethlehem Academy High School and graduated with the class of 1955. On May 11, 1957 she was united in marriage to Clayton LaCroix at the Immaculate Conception Catholic Church in Faribault. During the first years of their marriage Pat stayed at home and helped on the farm. Later she went to work at the Faribault Regional Center and retired after 28 years in 1999. Pat was a member of the Faribault Aerie 1460 Fraternal Order of Eagles Auxiliary. She loved camping, fishing, flowers, garage sales and adored her grandchildren. She is survived by her husband, Clayton LaCroix of Faribault; by five children, Calvin LaCroix of Faribault, Denise (Tom) McNamara of Faribault, Karen (John) Komp of Brooklyn Park, Minn., Gwen LaCroix of Minneapolis and Brenda (Dean) Krohn of Faribault; by five grandchildren, Naomi LaCroix, Matt Krohn, Katie Krohn, Dale Krohn and Tyler McNamara; by three sisters, Mary Burke of Inver Grove Heights, Minn., Lorraine Langdon of Faribault and Rita (Art) Benjamin of St. Paul, Minn., and by other relatives and friends. Cheryl Smith is the daughter of Roger Howard Smith Sr. and Josephine Perkins. Georgie Smith is the daughter of Roger Howard Smith Sr. and Josephine Perkins. Brenda Smith is the daughter of Roger Howard Smith Sr. and Josephine Perkins. Bonnie Smith is the daughter of Roger Howard Smith Sr. and Josephine Perkins. Roger Smith is the son of Roger Howard Smith Sr. and Josephine Perkins. Children of unknown (?) and John Preston Smith Sr.
Jennifer Rose (?) married Mike Harbick, son of Robert L. Harbick and Janice L. (?). Heather Bruner is the daughter of male Bruner and female ? Heather Bruner married George Coats. Aidan Donovan and Michelle Hendricks were engaged on 15 July 2010. Aidan Donovan married Michelle Hendricks, daughter of Keith Alan Hendricks and Namsun Hendricks, circa April 2012.